The gated Beachcomber Jupiter beachside community is a small complex consisting of just 56 condo and townhouse style homes located between US1 and A1A. 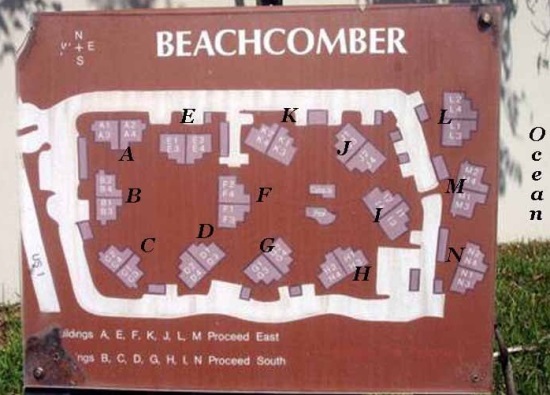 The Beachcomber Jupiter Florida condos are one level units while the Beachcomber townhomes are two story units. The community sits just on the Jupiter and Juno Beach line. This is a quaint little community within walking distance to many amenities, such as shopping and restaurants and the Juno Pier. On both sides of the Beachcomber you have county parks. View current listings for Beachcomber condos or read more about the features you'll find in this popular Jupiter community. 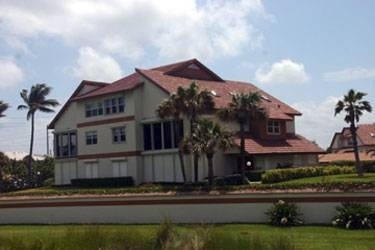 On the first floor, the L,M and N buildings sit on A1A and have direct ocean views as well as views of Juno Pier. The condos in the A, B and C buildings are all 2 bedroom 2 bath single level condos.These 2 bedroom condos are 1,500 sq. ft. and are either an upstairs or downstairs unit. These units sit closer to US 1. All the rest of the buildings have larger 2 bedrooms plus a den floorplan and are about 1,700 sq. ft. Above these units are the much larger 3 bedroom townhouse style units with two stories and vaulted ceilings and a loft area which makes a great TV or office space. These Beachcomber units are nearly 2,400 sq. ft. under air. Units come with either a garage or carport and the community features a beautiful pool located in the center of the complex. The condo fees vary by the unit size and they include building insurance, water/sewer and basic cable. Seaview in Juno Beach has similar style Juno Beach townhomes with garages and the same walk to the beach lifestyle. It to also is just around the corner. Let us help you find similar communities to Beachcomber. We specialize in Jupiter beach condos and Jupiter beachfront communities. Search other beach areas for Singer Island oceanfront condos or Jupiter Island oceanfront condos. Travel North to Hutchinson Island condos. If you have questions, or would like to view a Beachcomber townhome or condo, please don't hesitate to email or call Jim at 1-561-744-7025 for assistance. Beachcomber condos Jupiter Beach 4161 US Highway 1 Jupiter, FL 33477, Jupiter Oceanfront Condos by Jim McLane See his profile on Google.